Tarts are a bit of an obsession of mine, currently, but we’ve covered this ground. 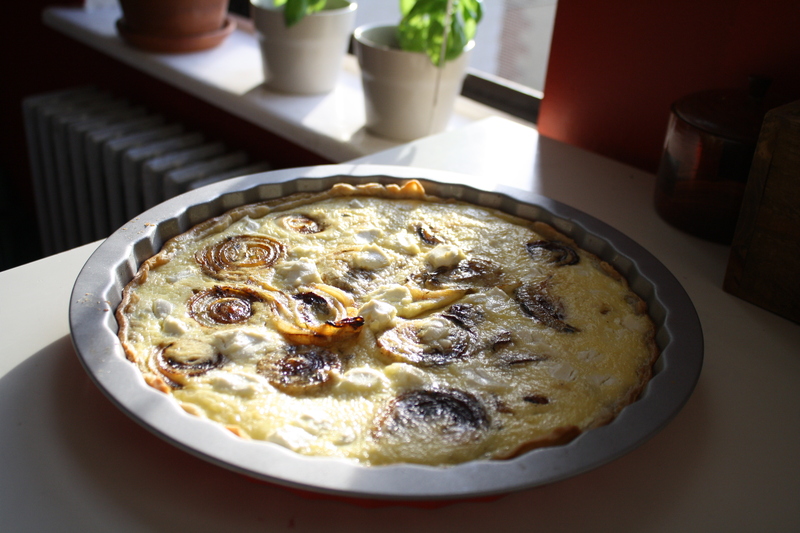 This savoury one is perhaps better described as a quiche, but it’s so elegant I prefer to call it a tart. I don’t know who started the “real men don’t eat quiche” thing but it has to stop. It’s not fair to the men of the world who might miss out on such rich delights. Although, that does mean more for me…. 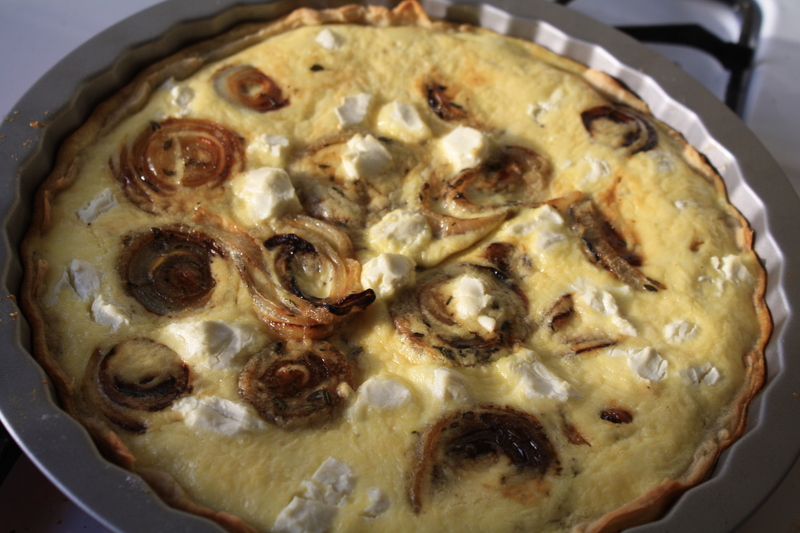 The recipe I worked from made this look so beautiful, with the rosettes of caramelised onion. It takes a bit of patience and a steady hand (and as you can see from my finished product, I was lacking in both), but it’s the kind of presentation that gives a meal real wow factor and makes everyone think you worked much harder than you actually did. Hmm. This could be my unifying philosophy of cooking: minimum effort for maximum glory. I still had half my pastry in the freezer from the nectarine and ricotta tart, so I used that for the shell. Preheat oven to 220C (430F). Line your greased or non-stick tart pan with pastry, then blind bake it for 10 minutes with baking paper and some weights or dried beans inside. After 10 minutes remove the paper and weights, and bake a further five minutes. Meanwhile, caramelise your onions in the oil in a frypan – it’s a little delicate to try to keep the rings together but worth it for presentation. Sprinkle some salt and thyme on the onions while they cook, then after removing onions from the heat brush them with a little honey (or caramelised balsamic vinegar, if you have it). Whisk eggs adn cream together, season with salt and pepper. Bring oven temp down to 180C (350F). Pour the egg mix into the pastry case, gently arrange the onions. Sprinkle with dots of goats cheese and some more thyme. Bake for 20 minutes or until golden brown. So delicious and chic with a little crisp green salad and a glass of wine!